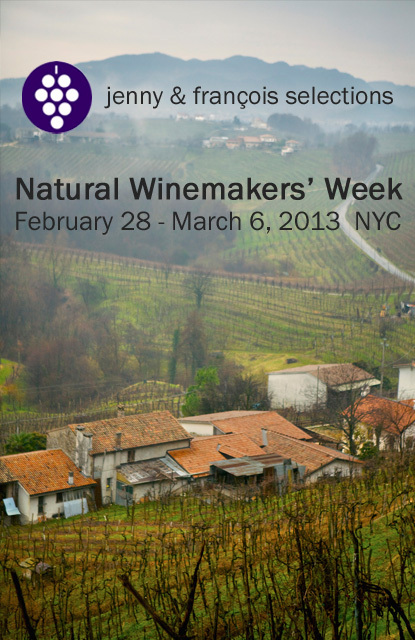 Jenny & François Selections is pleased to announce the 2013 Natural Winemakers’ Week, February 28- March 6, 2013! Fourteen natural, organic and biodynamic winemakers from France, Italy, and Oregon are coming to NYC for a week of wine dinners, classes and free tastings. Set your tweets to hashtag #nww13! 2-5pm: Astor Center Grand Tasting (upstairs) 399 Lafayette St.@4th St., (212) 674-7501. Meet 14 winemakers and taste over 30 wines. $25 general admission, $35 includes three 30-minute limited seating seminars. Buy tickets at: www.astorcenternyc.com. This event always sells out quickly! 8pm-12am: Party at the Ides Bar at Wythe Hotel, 80 Wythe Ave., Brooklyn, (718) 460-8000. Featuring all the winemakers, 20 wines by the glass, a DJ, and a killer view of the Manhattan skyline.